RM&T is the best radon mitigation company in Denver. Our professional staff has what it takes to Install our top of the line mitigation systems. Call us now for a radon test today and keep your family safe. 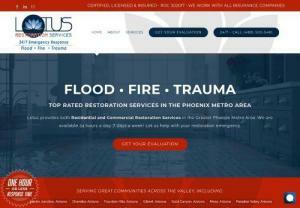 Lotus Restoration Services is a Phoenix, AZ metro area Water Damage, Mold Removal Repair, Fire Damage, and Flood Restoration company. Rocky Mountain Restoration is a Phoenix, AZ metro area Water Damage, Mold Removal Repair, Fire Damage, and Flood Restoration company. Steamatic of South Alabama is Mobile and Baldwin Counties premier Water Restoration, Fire Restoration & Mold Remediation Company you can count on. We also specialize in cleaning Carpets and Tile floors for both Commercial and residential properties. Does your property have an issue with damp? Are you concerned that your joists may have woodworm? Not to worry! Newcastle Damp Proofers are specialists from your local area ready to help you out. Call now for your next day survey. Tradewise Paving & Home Improvements have been installing block paved, tarmac and resin driveways across Southampton, Winchester and Hampshire for over 20 years. With their second to none reputation, get Tradewise to install your new driveway or patio today. Summit Restoration specializes in professional disaster cleanup and reconstruction. At Green Bay Water Damage Pros, we provide water damage, mold remediation, fire and smoke damage, and other restoration and repair services to the entire Northeast Wisconsin Area. Serving Green Bay, Appleton, Neenah, Shawano, Oshkosh, Sheboygan and all points in between. If you need immediate assistance, we are available 24/7, so call us today! MDJ has been committed to the conservation of heritage buildings for over 30 years as we have an experienced team of professionals, not only skilled in Brickwork but also specialising in Flint Work. Home page of a company that renovates historic fireplaces in the English style. On the website you will find the necessary information about our offers and a catalogue of our ready-made replicas of fireplaces from different epochs of English culture. Mould Cleaning Australia is an Australian owned and operated business specializing in mould remediation and mould removal. Damp proofing specialists, basement conversions and building solutions from Barnsley based company. We offer the best travertine tile repair service in the United States. We use only the products manufactured by pFOkUS - the leading tile and grout restoration products manufacturing company. All their products are eco-friendly and quite impactful. Water damage restoration Miami, water damage restoration near me Miami, water restoration companies near me, top restoration companies in Miami. Keep your home clean and safe with Enviro-Novus Restoration. Mold presence and damage is a common occurrence in South Florida properties due to the consistent high levels of humidity, elevated temperatures, poor ventilation and water incidents. Elevated levels of Mold can be a serious health hazard to occupants and may cause serious damage to a property. Depending on the shape of your deck we will re-secure the entire deck including rails, repair the damaged boards. And re-nail loose nails. If it's necessary will replace the and unfixable boards with the same type of wood as existing one. Phil Russell of Crackmaster Concrete offers home foundation repair services in the Greater Vancouver area. Visit his website for more info. D'Sapone experts offer patented travertine polishing in Nassau, eliminating future etching issues and delivers an attractive finesse to your tile. AAA Restoration provides professional fire, mold damage removal & water damage disaster restoration services in Salt Lake City & Ogden Utah.